probably been done to death but I'm a little bit late to the VX party. just like to sound out my idea of a breathing system. currently the PCV valve in the manifold is staying and will stay. remove timing chain inspection plug and fit m22x1.5 to -10 adapter - plumb this into a decent Raduim-type catch can with an inline tap fluid drain so I can empty. fit another check valve to the exit of the can meaning only blow-by gas can escape through another mini filter. this would in theory increase the size of the crankcase vent when under load from 10 to 16mm (intake PCV closed, cam cover vent) and allow the oil/vapor/cappuccino mix to be collected and drained whilst still allowing fresh filtered air into the crankcase and satisfying the closed loop PCV system and idle and low load with no nasty sh*t going through the intake - the bit that will make its way in there is from the factory PCV that shuts as soon as the pressure equalises in the manifold so minimal. how does this sound, anyone have any experience? PS: had anyone fitted a Crank case pressure sensor to monitor engine life or have any idea of what numbers it produces under load? a set up like this should mean the CCP is always sub ambient unless there's an issue with the ring pack. 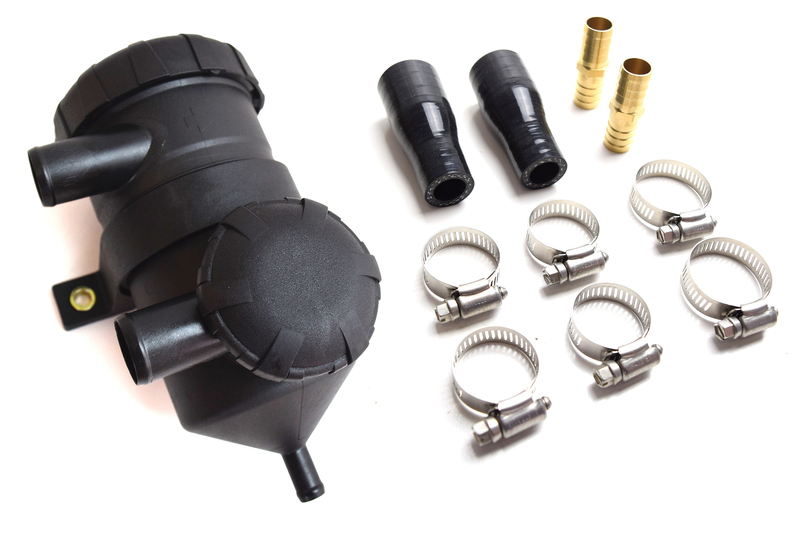 Forget all that, hose from rocker to catch can, then from catch can to air intake. Make the hose from catch can to air intake go right up in a big loop higher than your catch can and air intake on the air filter. This set up is on my stage 2 SC and I get no oil in the air intake and very little in the catch can, the engine breathes really well infact as oem intended. This set up is a revised version of Chill's long investigated set up - keep it simple. I've read a bit about this issue on the forum and not wishing to appear to thick, but I'm not really up to speed on why. What catastrophic engine issue will manifest itself if the rocker breather outlet is simply vented to atmosphere? have been doing this for years! ..........but you can get oily smells in the cabin. The theory is that the oil and sludge dilutes the fuel and lowers it's octane. Something you don't want if performance is your goal. Plus in supercharged cars it clogs up the laminova cooling fins, raising the intake air temperature which in turn reduces the air density and therefore the oxygen content of the air going in the engine. This means you can't put as much fuel in and you therefore get less power. Suppose I could have just said you get less power ! So now that's out of the way. Ideally suction on the breathers simply makes sure the crank case is not under pressure. If it is there's more chance of oil getting past the piston rings and the engine burning it. Seems I have come over a bit Nev ish ! I read all the threads about oil catch tanks, none of which explained what damage (if any) venting to atmosphere would cause. I bought a catch tank but never installed it. People with catch tanks all commented on how little residue was collecting in their tanks. It seemed to me (and I could be wrong) that the catch tanks rely on the temperature differential between the emissions and the tank itself in order to condense the vapour. Ideally for maximum efficiency the tank should be at whatever the ambient temperature is outside the car. However the tank is situated inside the engine compartment and its efficiency limited by whatever reduced temperature differential is available in that environment. The efficiency of any particular tank therefore appears unknown compared to the original emission. So like Batman I decided to vent to air. Initially the hose ran conveniently down the offside to a spot roughly in line front of the offside wheel arch. This resulted in oily smells in the cabin. This confirmed that without being drawn by a vacuum the emissions were capable of venting themselves. I then extended the hose across the car to close to the front of the nearside wheel arch so it protruded under the car a couple of inches into the under car airflow. No oily smells; the end of the hose is blackened and slightly oily. I've left it like this because I failed to see why there was all this faffing about with catch tanks if strictly speaking they weren't necessary. Of course if you're closely monitoring every aspect of your car you might want one, and if you have one, a sudden increase in residue might be a pointer to something amiss with the engine. Otherwise why bother? I keep filling my catchtank on my old Z22se and on my B207 pretty quick. Still don't understand others not having this. Edited by smiley, 13 April 2019 - 07:31 PM. Interesting, what are the cars used for? (Sorry, I have a feeling I should know but I genuinely have no idea who has what and what they use them for on the forum, my brain works in a peculiar way, anything that's not relevant or useful it filters out, this made things difficult at school because I could never remember boring lessons even if they were important Thank God for mnemonics.) And, how do you define 'pretty quick'? After what you've said I might just connect my catch tank out of interest. 2 to 3 trackdays and my 1.5 liter catchtank is full. Edited by smiley, 14 April 2019 - 05:35 AM. how flammable is the oily vapour , anyone know the flashpoint? Catch tanks should have some sort of mesh, grid, or steel wool in them. Their pupose is to catch any tiny droplets of oil that get carried out the engine with the (blowby) gasses from the crankcase. The normal PCV system already tries that with ridges and channels in the block and also in the cam cover before it gets to the exit. But cost and design considerations on a road-car engine are the limiting factor here so most OEM setups run into limitations when increasing engine output significantly. The OEM setup is not 'wrong' it just reaches it's limits and has it's drawbacks. Any other pure gaseous components are let through by a catchtank. What happens next is up to the user.. The exit from the catch tank can be routed back to the intake after the air filter but before the TB, so the gasses (now free of actual oil drops) are burned in the engine. This can still give some octane reduction so very high boost should not use it, but as it should be 99.9% clear of actual oil drops it should no longer coat TB's, manifolds and inter/chargecooler insides with oil. The exit can also be left open and a mesh filter put over the end to vent to the atmosphere. That's not very eco-friendly (HC emissions) and also tends to give an oily smell in the car under many conditions. 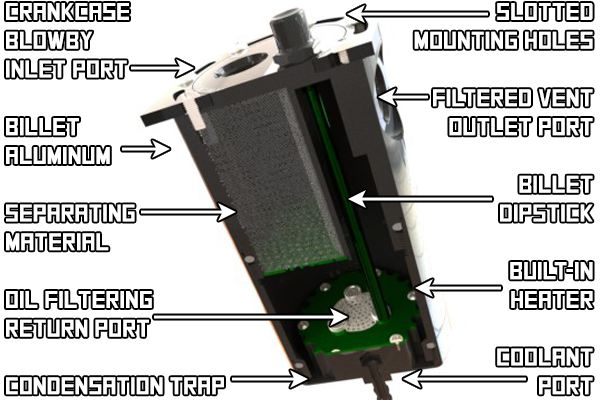 You could just forego the whole catchtank and just stick a vent filter on the cam cover outlet (at idle and part load it can draw air IN so it needs a little filtration) and leave the catchtank off but you run the risk of it drooling oil along the side of the block under use. Track operators tend to not like that oil drips onto the road and for that reason catch tanks are mandatory in race/rally use. Some more complex catch tanks (or better called air-oil separators) can have the drain connection routed back to the sump (preferrably under the level of the oil). This way any oil that's caught in the tank gets fed back into the sump. These can have connections to the cooling system so it gets heated internally and you don't get too much water condensing and fed back into the sump. So yeah.. Nothing breaks if you just take off all the hoses and (in the case of the Z22) plug the PCV port in the manifold. It will just get pretty oily and smelly in the car and it may drop oil onto the undertray. IIRC the build book covers welding in a larger diameter vent to the cam cover breather system. This is to slow the speed of crankcase gasses such that oil droplets can 'drop out' of the aerosol. This would help separation on high boost engines where crank case pressure can be an issue. Aaah. Thanks for that Arno, I was hoping that someone with some detailed knowledge would give some input. I'm going to try my catch tank, which seems a very basic affair compared with what you've shown (but it was also a very basic price). So the ideal set up to vent to air would be a one way valve venting out to air with a 'T' to a one way intake valve from a filter? In your case you you'd just cut the existing (long) hose you have and put the catchtank in-line. Keep the rest 'as is' unless you want to plumb things back into the intake. All you are wanting to do (I gather) is to keep an eye on anything expelled from the breather connection to see if there's any sudden increases. If you are happy with the rest of the current setup then just keep that all the same. Many simple (chinese ) catchtanks are just completely empty inside and don't have any baffles. In these cases you want to open it up (if possible) and stuff some (stainless) steel wool in there to act as a medium to catch droplets. Perhaps add something like a small barrier/shield so the air has to travel through the steel wool and doesn't just short-circuit from the inlet to the outlet. You must have read my mind . This morning before I read this I took the top off my catch tank and sure enough it was empty, and, the innlet/outlets were only 20mm apart so as it was it was effectively useless. The inlet/outlets were a convenient 10mm size so it was easy to plumb in a copper 10mm tube from the proposed inlet to low in the tank. A cut off piece of an old small fruit tin conveniently fitted the diameter of the tank with a gap of a couple of mm. So once in, place I wrapped steel wool (didn't have any stainless but will do temporarily) around the copper tube until it filled the fruit tin and then replaced the tank top. Job done.